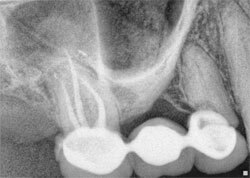 Root canal treatment can be necessary in the event of a dental abscess. A dental abscess is the worsening of a dental cavity on the inside of the tooth affecting the pulp chamber, which comprises the "meat" of your tooth. A dental abscess can also occur as the result of trauma to the tooth. 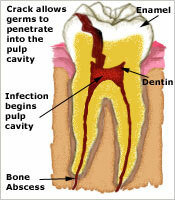 A dental abscess usually starts with a cavity. When a tooth has a dental cavity, it is open to bacteria and germs. If not filled in a timely manner, a pocket of pus can develop. Since the infection is on the inside of the tooth, the pus has no place to drain, which creates a dental abscess, pressure and pain. This is why a cavity should not to be taken lightly. A dental abscess is a serious infection that can result in pain, loss of a tooth or worse. If the dental abscess goes untreated, the bacteria will thrive on the living tissue inside the tooth, making their way to the gum and further still to the bone. Advanced dental abscesses can kill the root of the tooth which will relieve the toothache. But don't be fooled by thinking one of your toothache remedies is working, it just means the dental abscess is worsening. If you are suffering with a dental abscess, the experts at the Chris Mercier Dental Practice can help. First of all the pain is stopped by draining the abscess and removing the bacteria to control the infection. This will help to relieve the pain and create a bacteria-free area that can be treated. Antibiotics are sometimes used but on their own will not cure your dental abscess. Once the tooth is comfortable, we will need to get to the root of the problem. When the infection is under control, the first order of business is to save the tooth. Most often this means root canal treatment. Contact us on 0151 709 7948 today to find out more about root canal treatment in Liverpool.